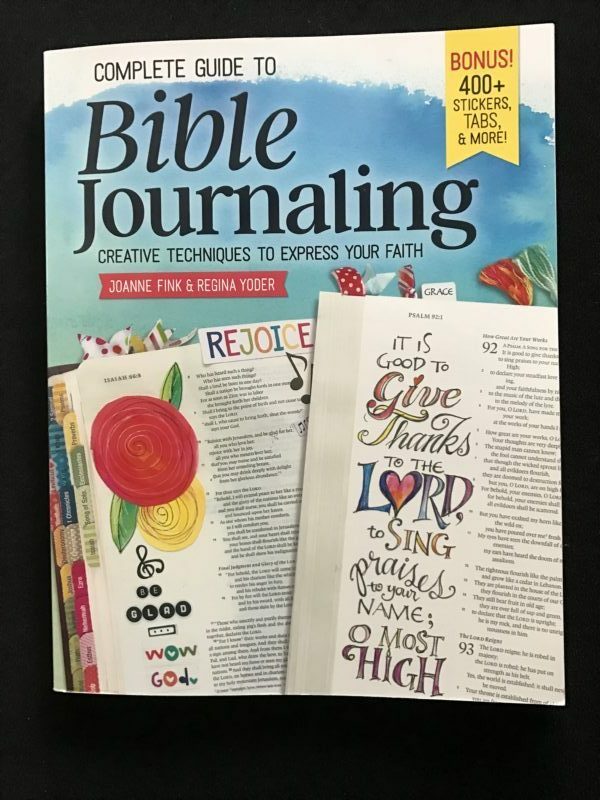 Joanne Fink and Regina Yoder have kindly included some of my work in their new Bible Journaling paperback book, Fox Chapel Publishing, $19.99. Click link to order. 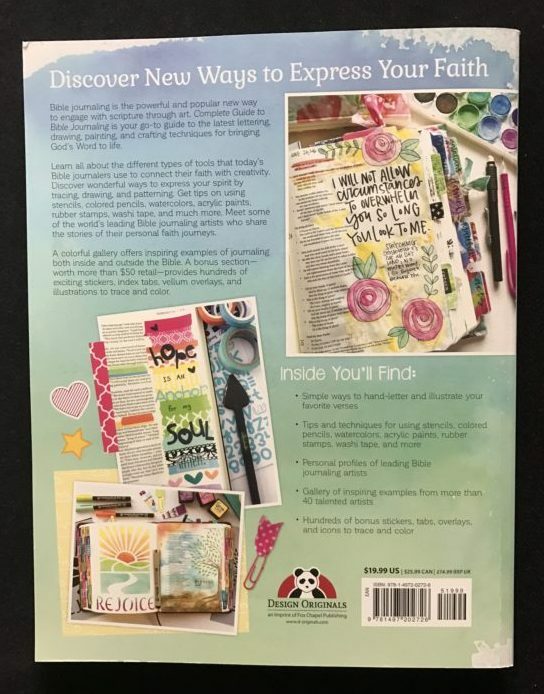 Read on…..
Their new book offers ‘how to’ instructions for design, illustration and lettering a Bible verse. They take you step by step, so whether you are a beginner or advanced, you have tips for making your pages meaningful, as well as attractive. 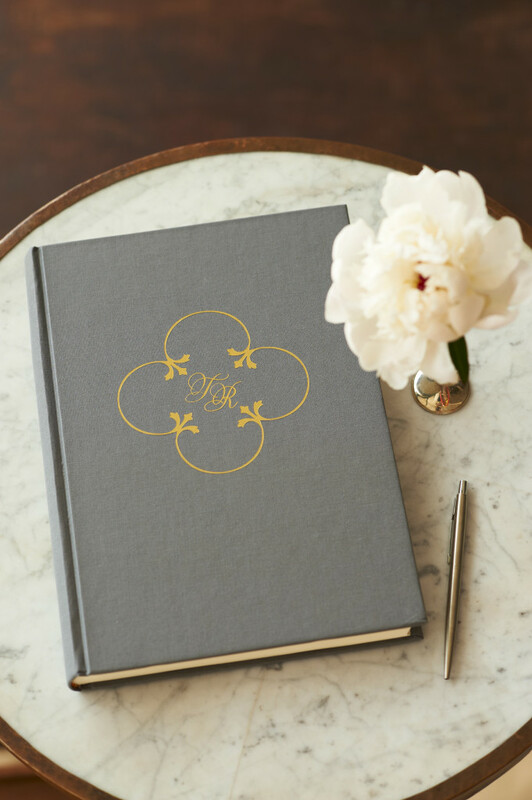 Included are sample pages from over 40 dedicated journalers, showing the diversity of artwork styles while offering inspiration for your pages. 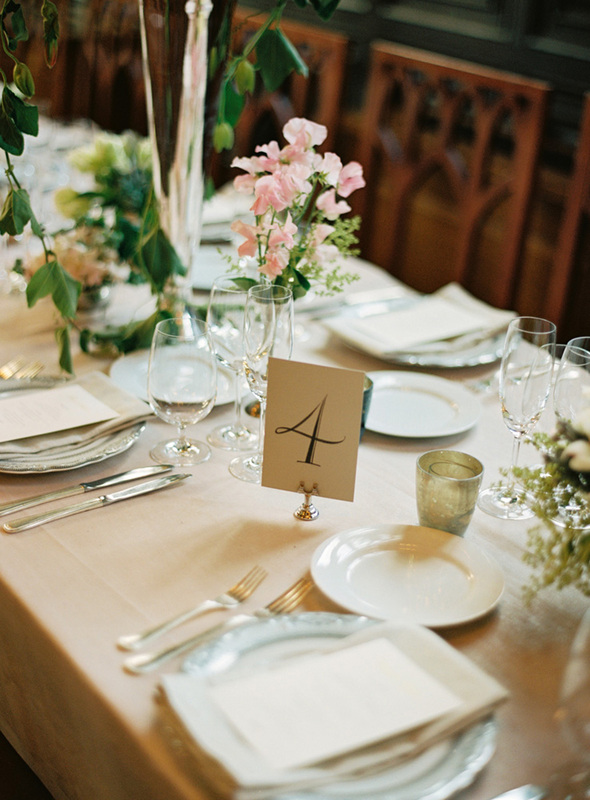 Below, see one spread from Karla Dornacher’s lovely section. 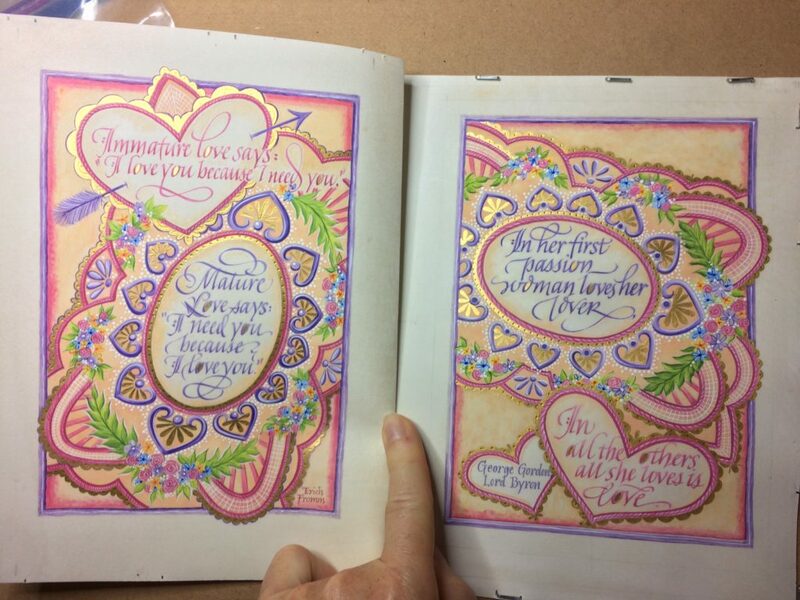 Friend and colleague, Joanne Fink decided to include some images from my collection, which expands the books’ focus from within the Bible pages, to lettering Scripture verses ‘Outside the Bible.’ In the section below, Joanne takes Proverbs 3:5-6 and compares the way that numerous artists, calligraphers or journaler’s have designed the same verse. See the book for the variety! As you can guess, verses can be designed for greeting cards, framed art, books, walls of churches, businesses, homes, etc. 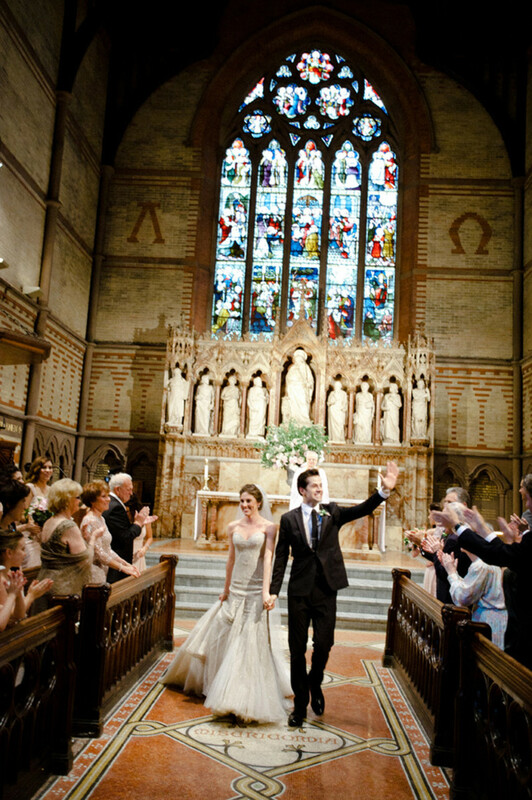 You can choose where you want your art to appear – personally (in your Bible) or publicly. My focus has always been a more public application, since I have been active in business since around 1980. 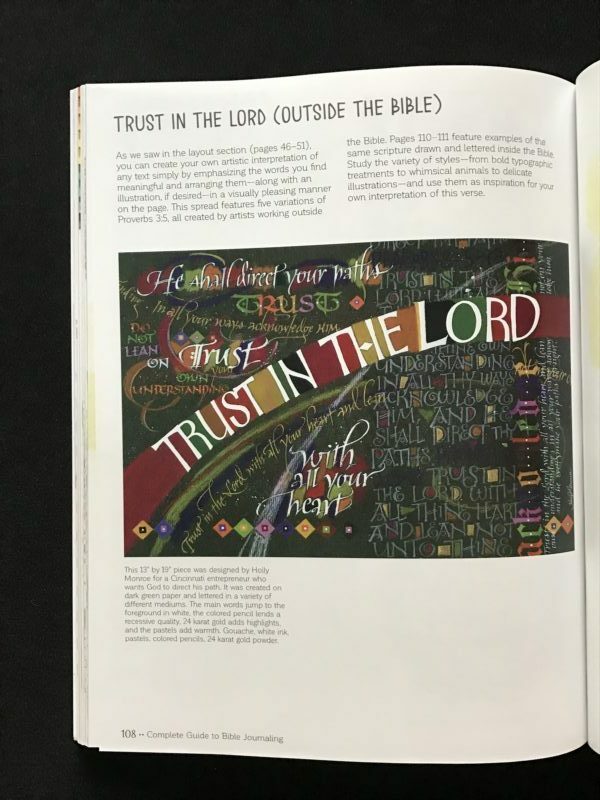 Below, you will see Bible Journaling’s two page spread of some of my work. 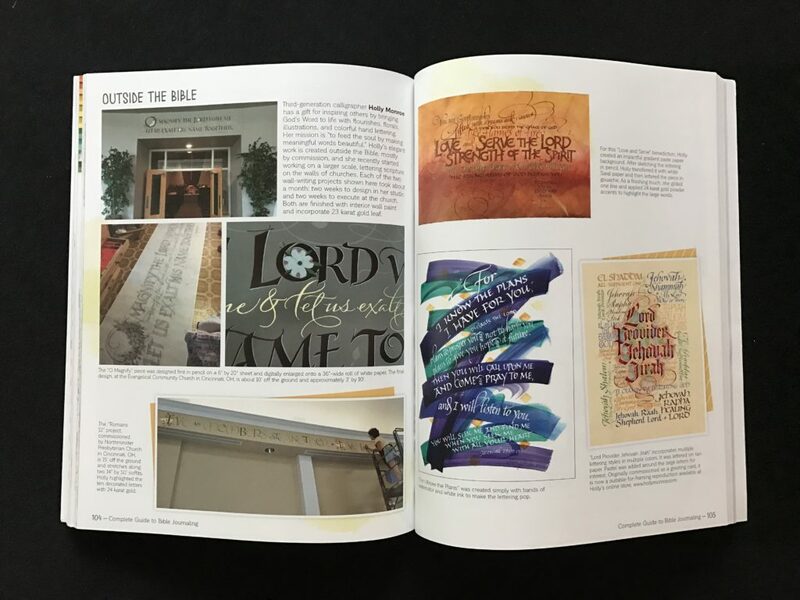 On the left, it features my church wall work at Evangelical Community Church and Northminster Presbyterian Church, both in Cincinnati, OH and on the right page, 3 commissions in my collection. You will find larger pics and others in my www.HollyMonroe.com > SHOP+ > Prints > Scripture section of my website. Love and Serve, Know the Plans and Lord Provider, Jehovah Jirah. 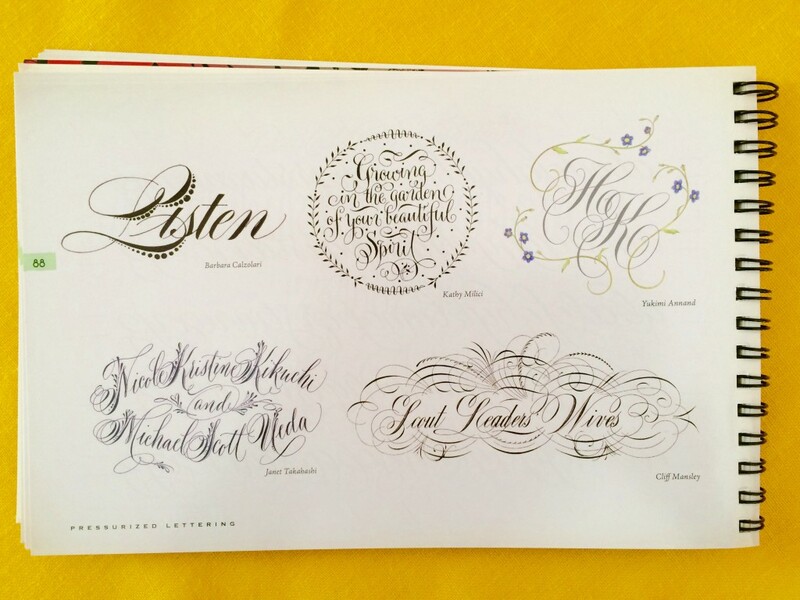 Two page spread of Holly Monroe’s calligraphy in new Bible Journaling book. 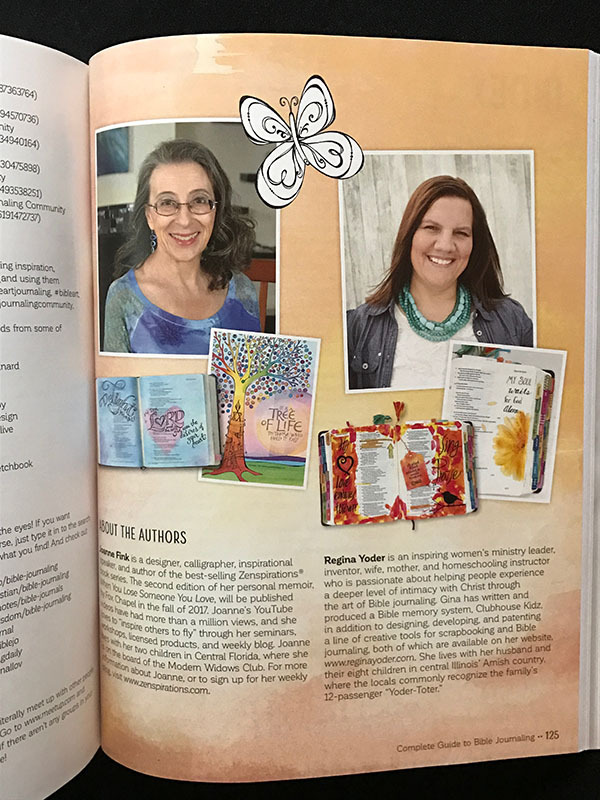 Lastly, I’m showing you the back cover of Joanne and Regina’s book, showing not only hand-created Bible pages from other artists, but also a list of the multitude of items included in their generous book. 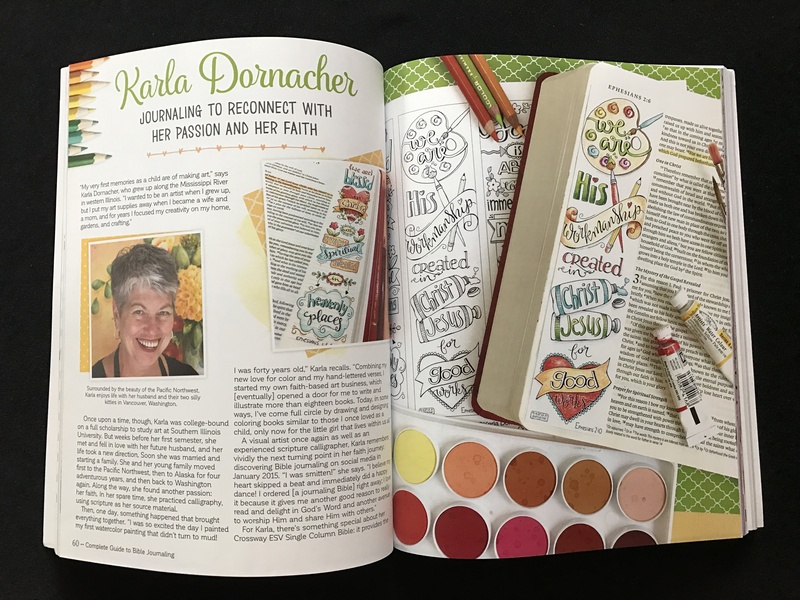 I believe this book will be an inspiration to adults and children, to artists/calligraphers/journal keepers who care about their walk with God, through His Word. 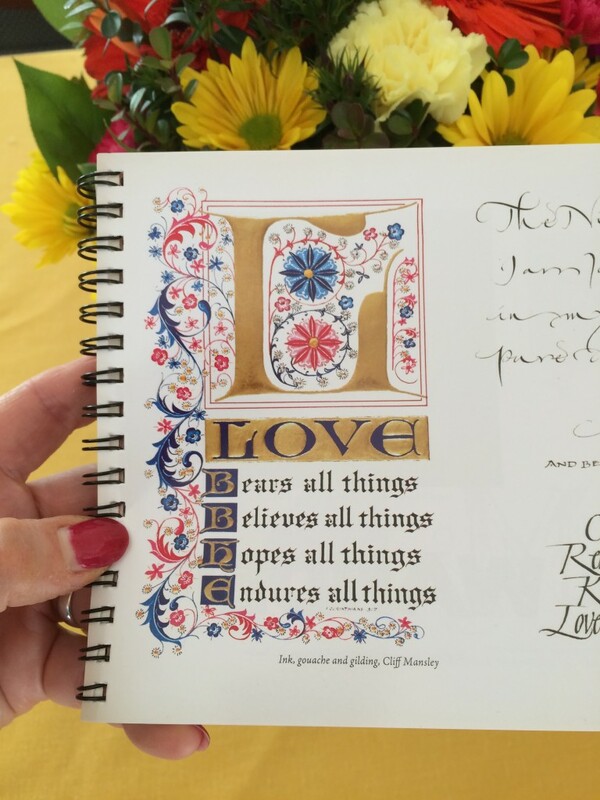 Journaling has always been around, but artistic Bible Journaling is a new emphasis. 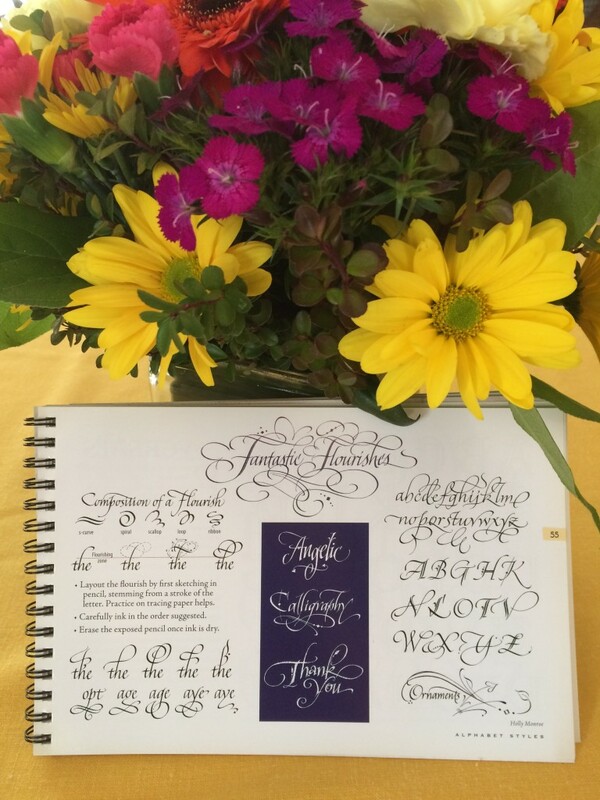 I first encountered a similar type of this activity with friend and colleague Tim Botts, who would calligraphically illustrate a section of Scripture each morning, as he read his Bible. His sketches turned into his 20+ books, starting with “Doorposts” through Tyndale Book Publishers. 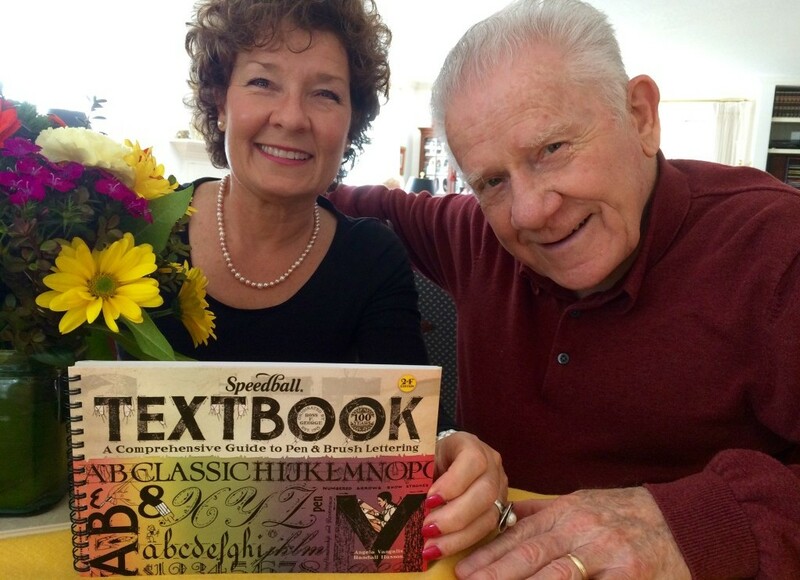 Tim has certainly been an inspiration to me in my calligraphy career. Take a look at his work, if you haven’t discovered him yet! 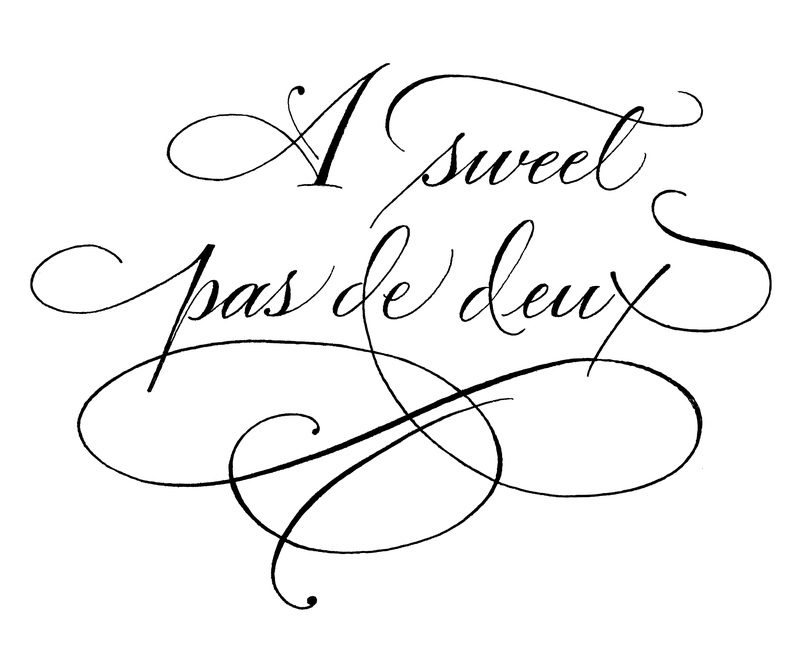 To my calligraphy friends near and far! Here is a little update on the Modern Book of Hours that I am working on. It is a book about the Passing of Time, Seasons, Seasons of Life on into Eternity. The pages shown below are pages 90 and 91. 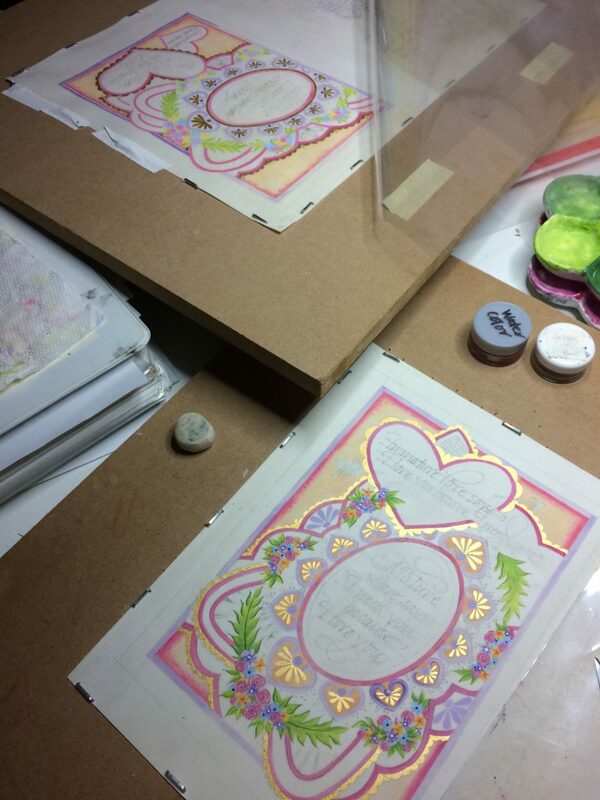 In this blog post, I will give you a little glimpse of the process. More in future blogs. As some of you might know, my client commissioned a 144-page book project, that has taken me quite some time. 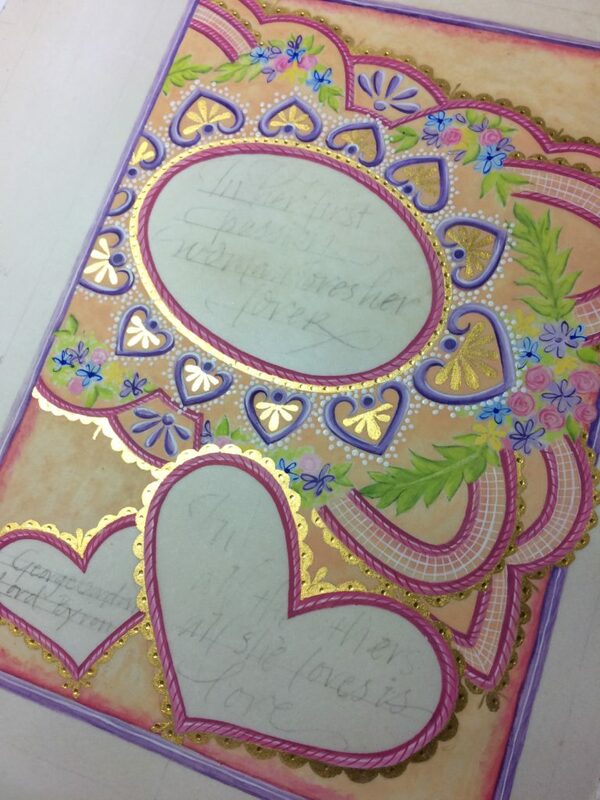 Each facing page is to match and be as intricate as possible. 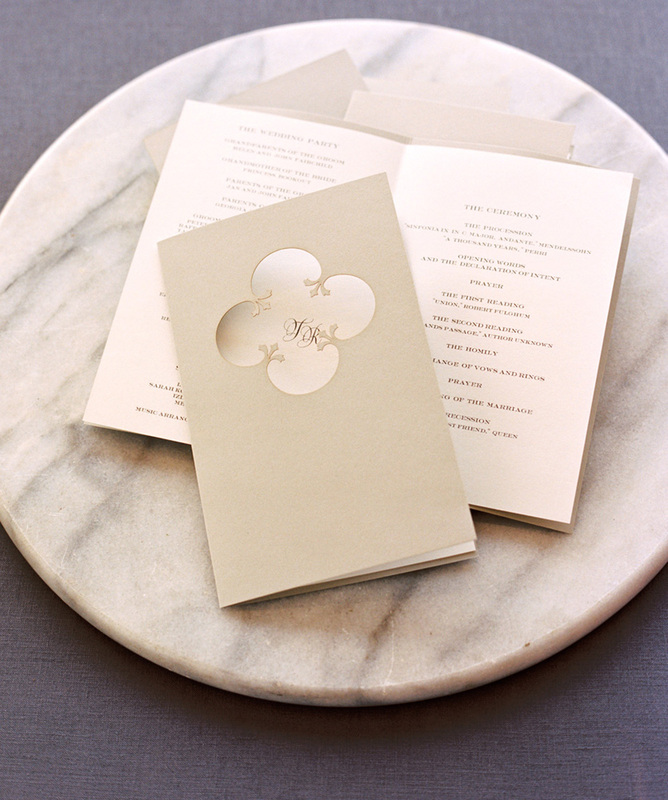 It is a picture book, where each design can stand alone. (Reproductions are available). I will be making a Collection category of The Book of Hours images on my website in the near future. A few are posted in my SHOP now. The first image is the completed page. Calfskin with tiny strokes of watercolor and 23k gold powder applied and burnished. My client typed the wording that he desired and indicated whether it would go on the right or the left page. 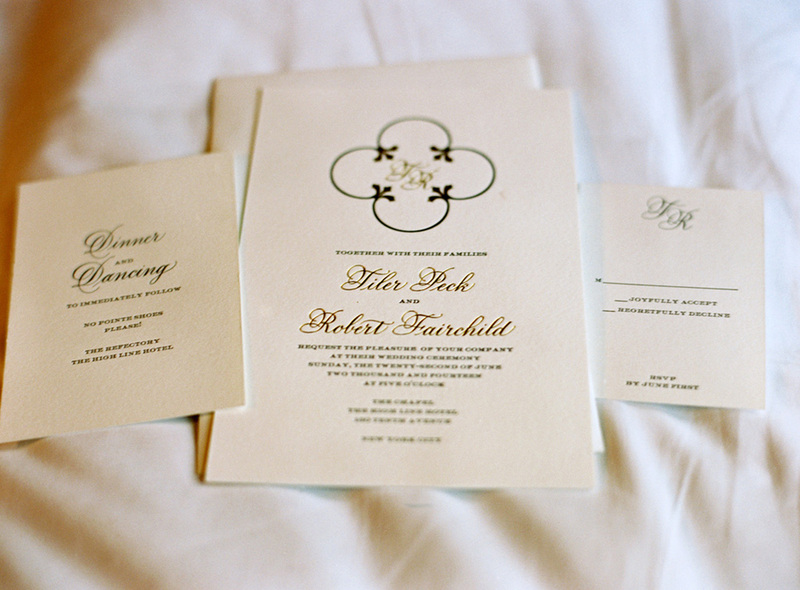 It was my job to imagine the creative layout for the illustration and calligraphy. A pencil rough was the first step of the process. 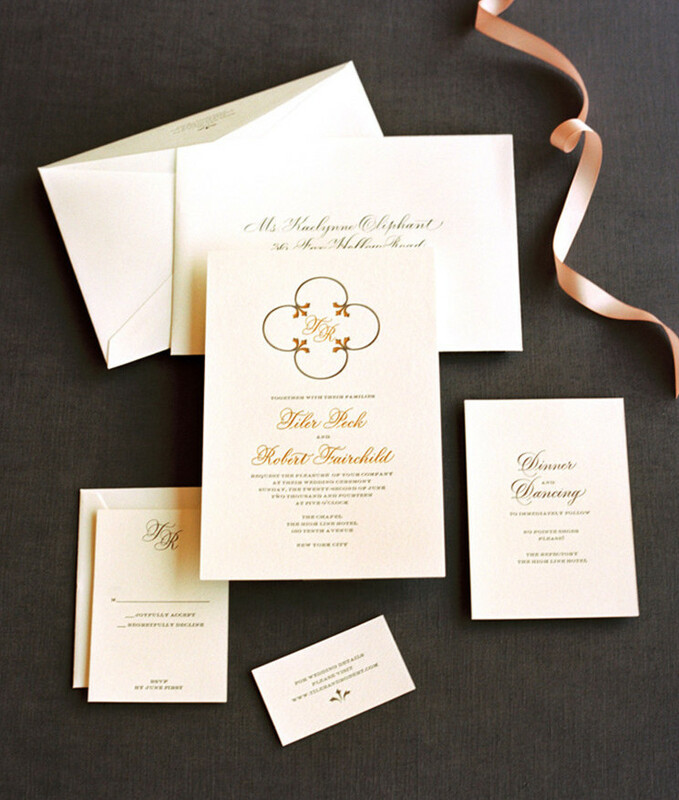 It took 2-3 years to conceive of all of the designs. 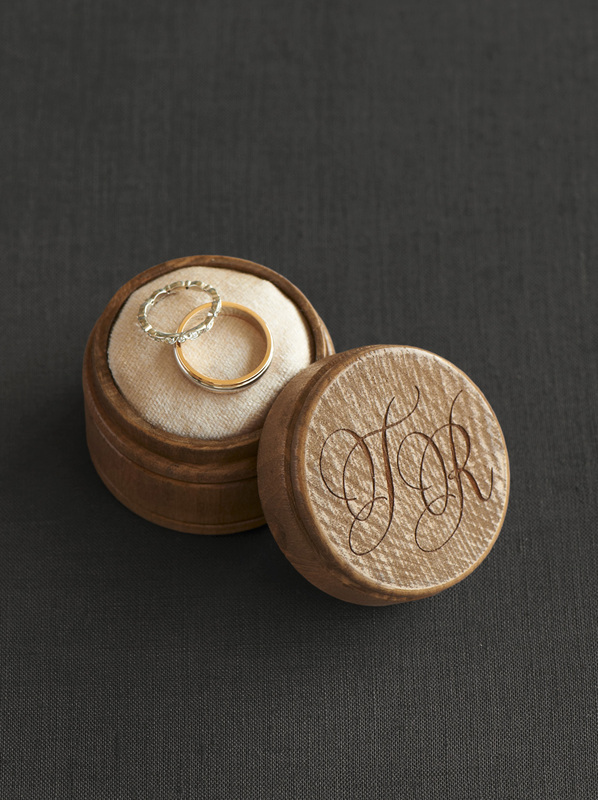 In their intricacy, I would email them to my out-of-town client and he would ask for adjustments, I would rescan and when we settled on the design, I would file it away in my computer for future reference….it would then be transferred onto calfskin for the final gold and color work. 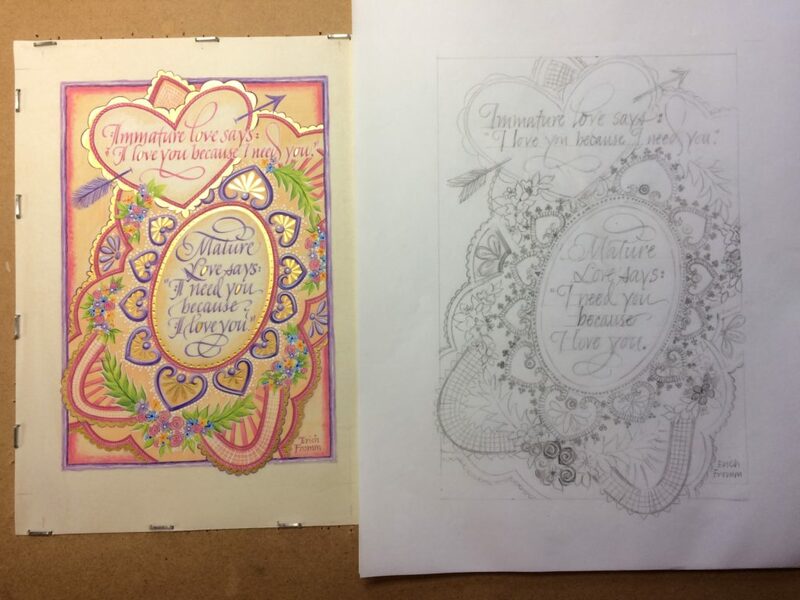 On the right, below, is a sample of the pencil sketch with it’s final on the left. Below is what the calfskin looks like when I purchase it from Pergamena. 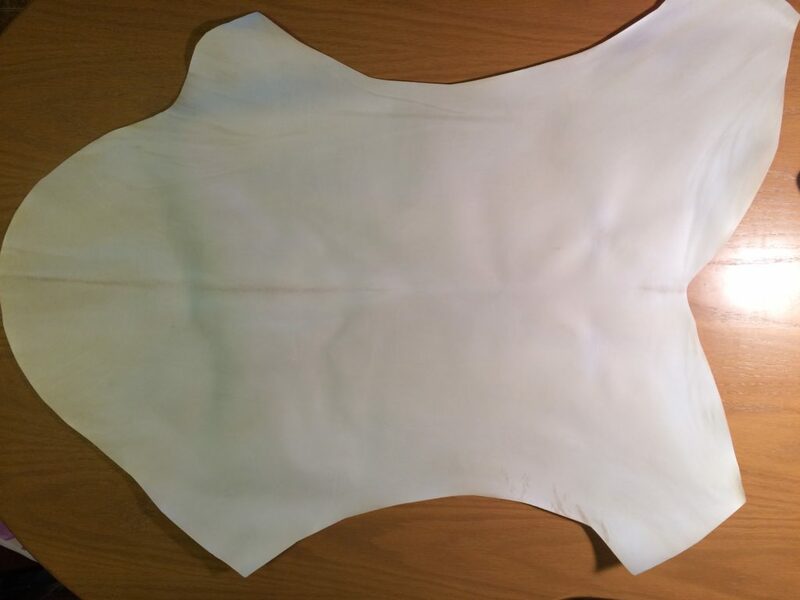 It’s manuscript vellum, which I prefer for book projects. It is much finer than what I call Parchment (which I use for Broadsides or work that will be framed). Once the skin is prepared, I attach it to a board so it will lie flat while I paint it. By the way, the tape on the upper page/board, is typically not there. The skin had pulled away from the staples, so I taped it with Artists Tape. One mistake on my part was to have the pages cut down too small. As you can see, there is only about 1/8″ margin where the staples sit. 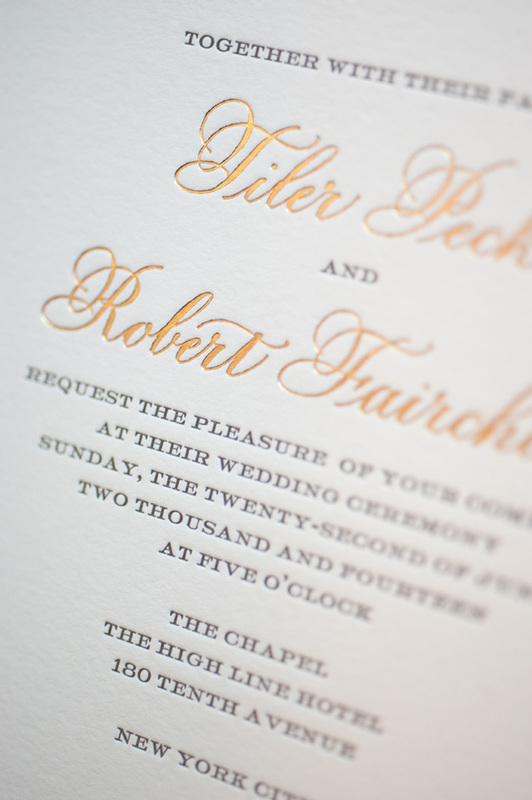 I would have liked to have 1/2″ or more margin, which would later be trimmed off of the page. I thought I could get away without hydrating and mounting the skins, but after painting page 3, I realized that stretching the skins would give me a much better result in the end. Initially, I made a little paint chart, which helped me to stay on track with my colors. 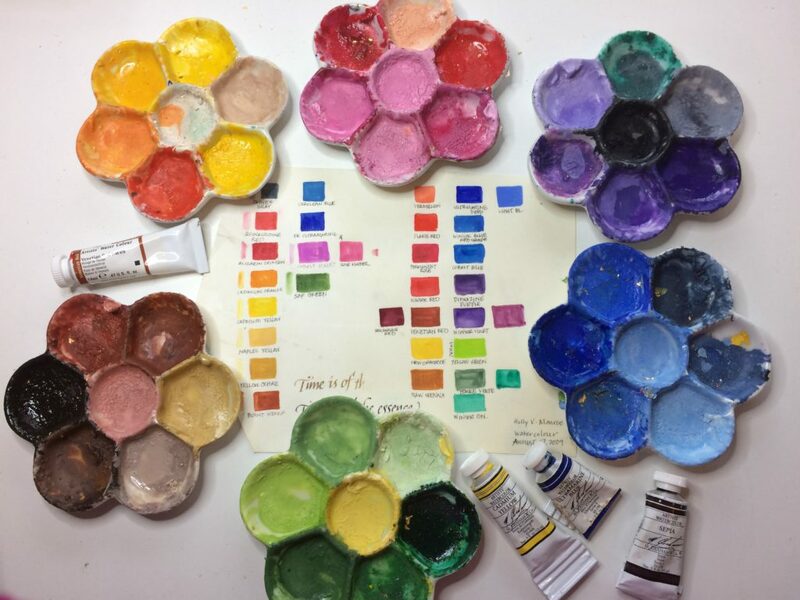 I’m not using all of them on the chart, but these little floret porcelain pallets will show you how I can go back and repeat similar colors on subsequent pages in the book. Using the same blues and greens, etc. gives some continuity, to a unique book. Below is page 91 in progress. Lettering still to be lettered. 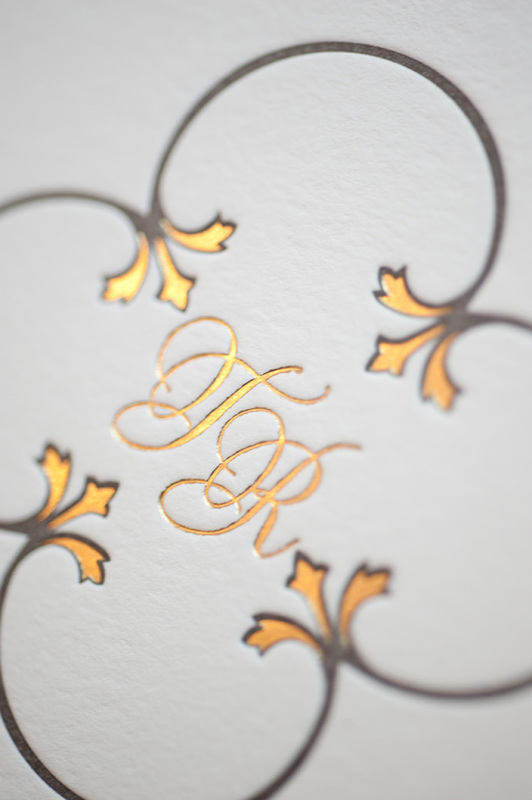 The 24k gold powder, which was burnished to give it some shine, was also debossed to create shiny little dots on the gold. 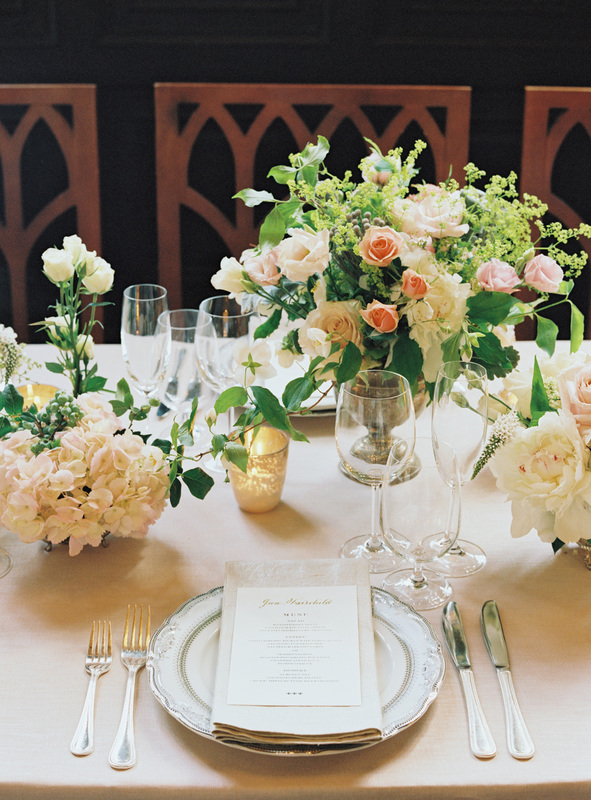 The more detail the better! 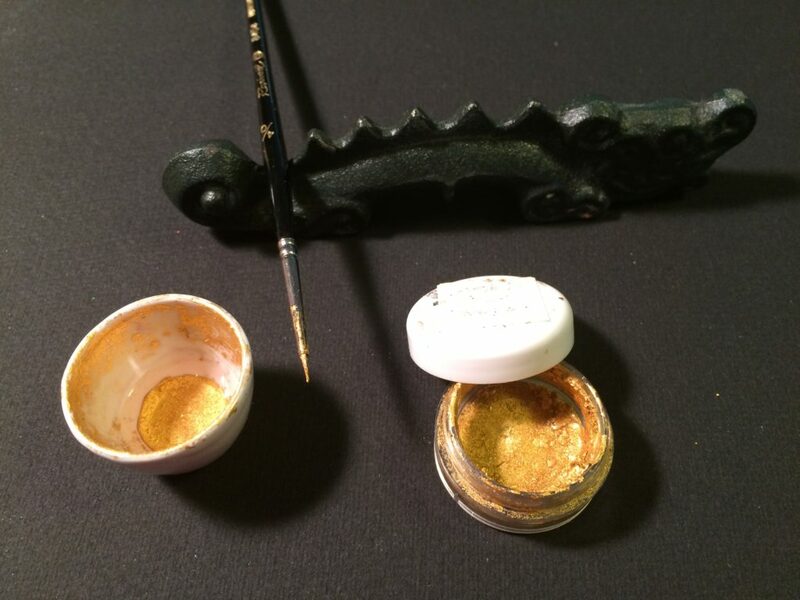 The little container with the lid, on the right, is the liquified 24k gold powder. I add distilled water and then a tiny drop of clear Elmer’s glue to help it adhere to the page. Pictured is one of my miniature Kolinsky hair brushes. This one is a 4/0. Very tiny. 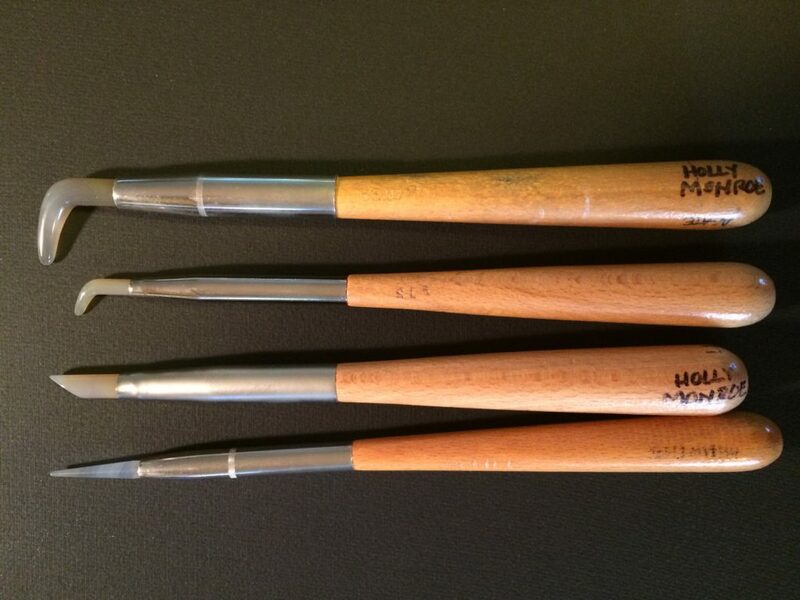 There is a line of ‘miniature’ brushes in the Series 7 line, which I found to be extremely helpful in getting the detail. 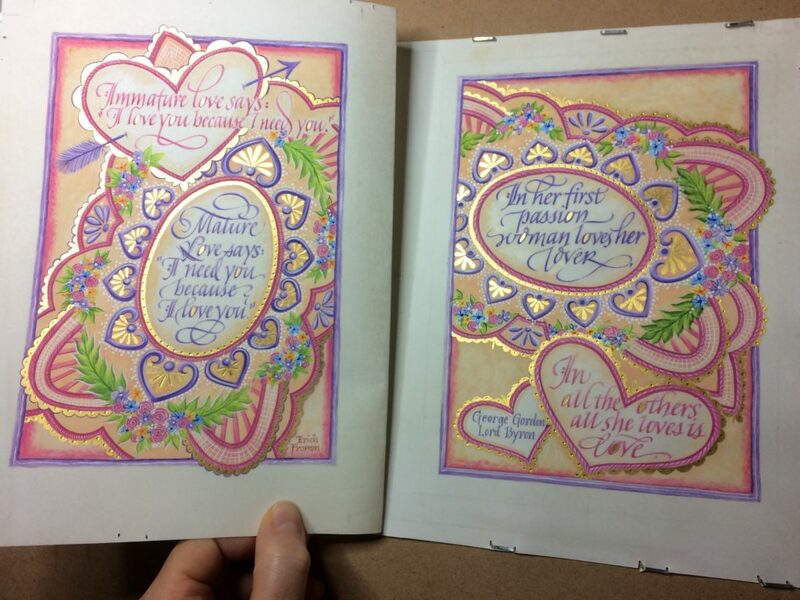 (Many other pages have raised gold on a gesso base). And here you can see the agate burnishers. I use any of the 4 on various projects, but on this small page, I used the curved burnisher that is the second one down and the pointed one on the bottom for debossing the dots. And once again, below, is the final page. You have to angle the light just right to catch the glint of the gold. The pages will be removed from the boards and I will flip them over for pages on the opposite side. On to the next pages, which will have lettering to resemble Hebrew, wording from the Song of Solomon and the bust of a man and woman facing each other in ornate cloaks. Stay tuned! 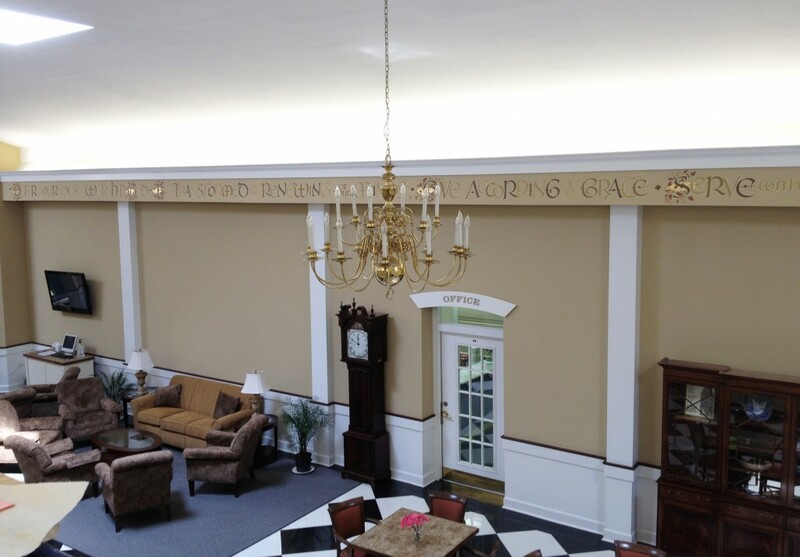 In the Spring, Associate Pastor Nancy Ross-Zimmerman approached me with the idea of lettering and illuminating phrases from Romans 12, in Northminster Presbyterian Church’s Commons room. After meeting with the art committee-Rich Schafermeyer, Gary Lord and Helen Haberstroh, I was off and lettering! First I sketched 3 styles on graph paper. 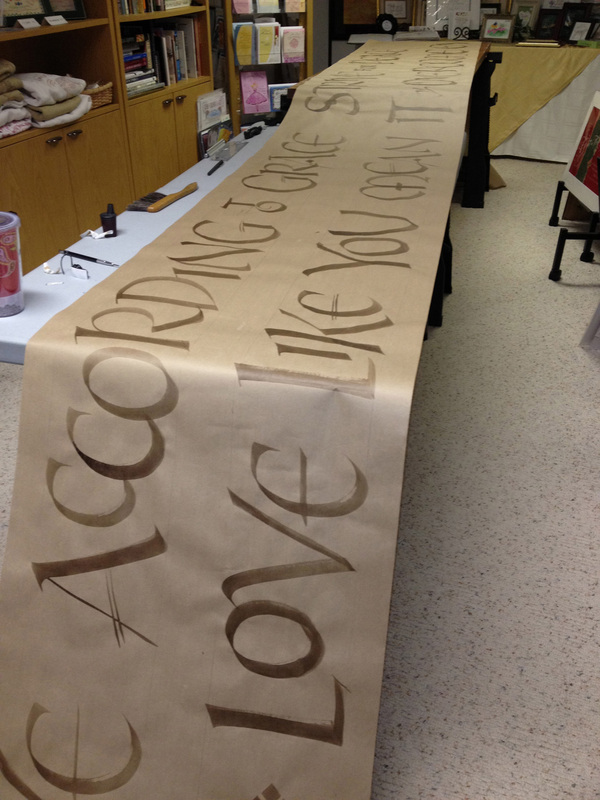 Uncial was their choice, so on a long roll of brown paper I lettered the words, in a first attempt to see how the words might look. 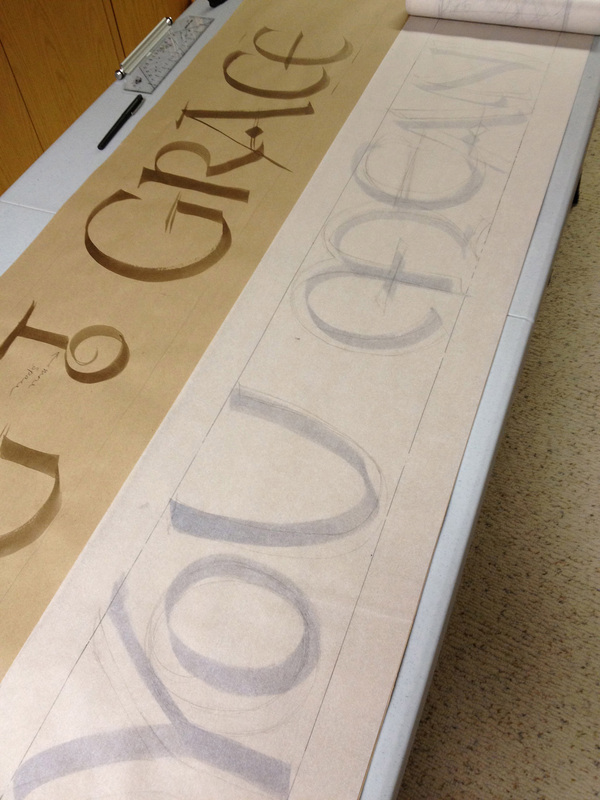 Next, I traced over the letters on a 12″x 50′ white tracing paper, refining them as I went. 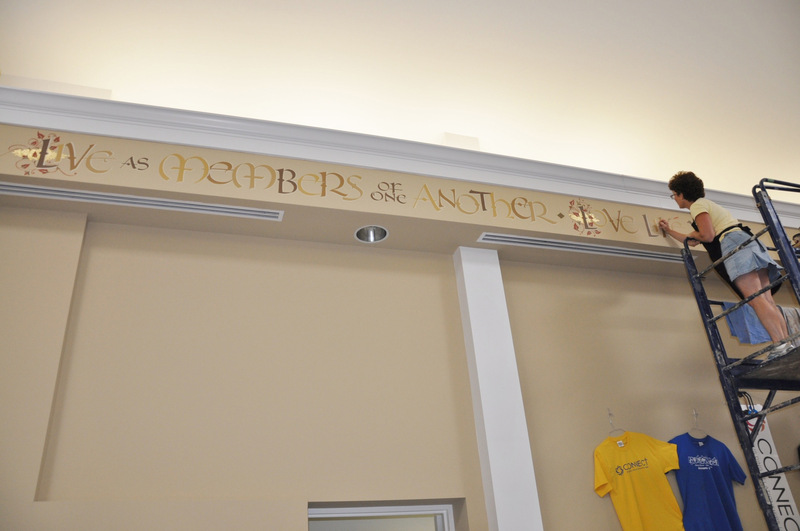 While standing on a rolling scaffold, compliments of Gary Lord of Prismatic Painting Studios, I taped the 50′ long sketch along each of the two soffits in the Commons Room. Fifteen to eighteen feet off of the ground. After tracing it onto the walls, the painting began. 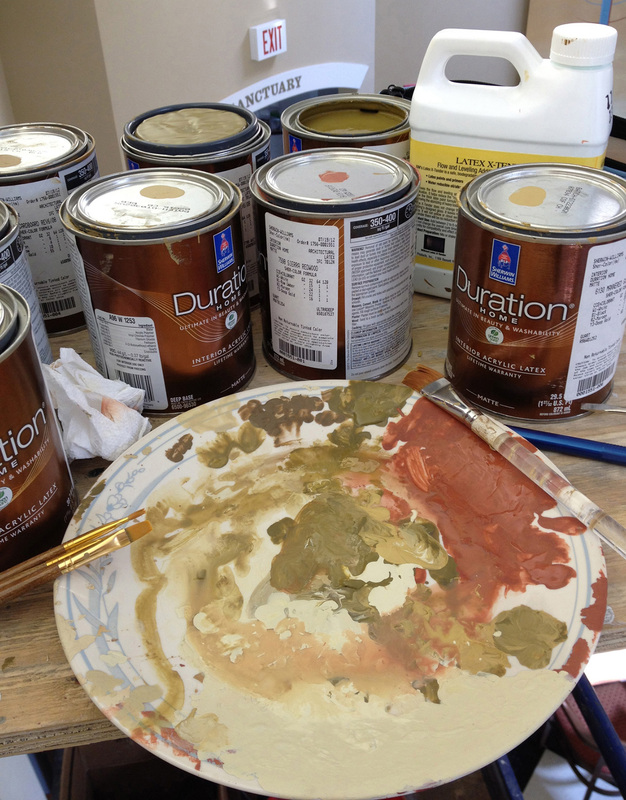 I used eight colors of Sherwin-Williams paint. Each letter was painted twice and a highlight was added. 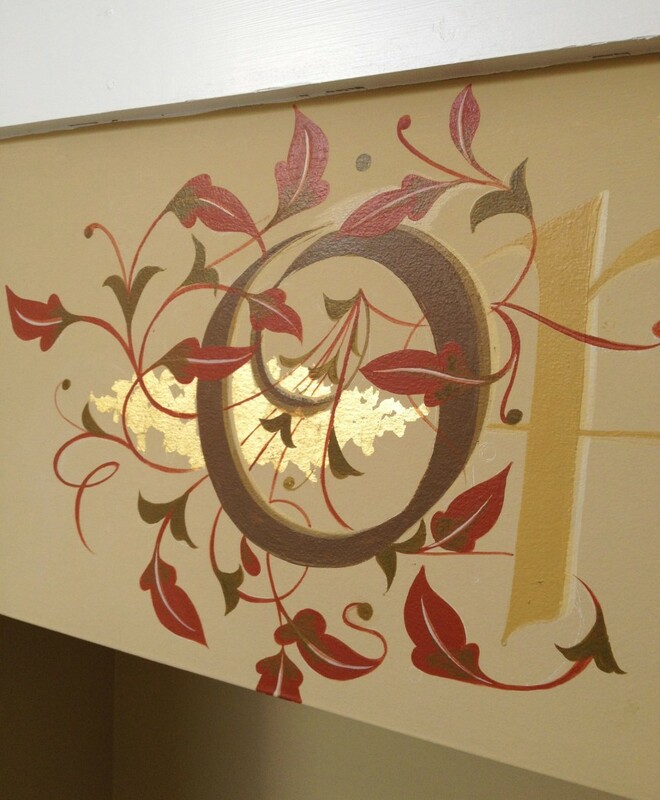 Ten illuminated letters were also a part of the project, one at the start of each phrase. 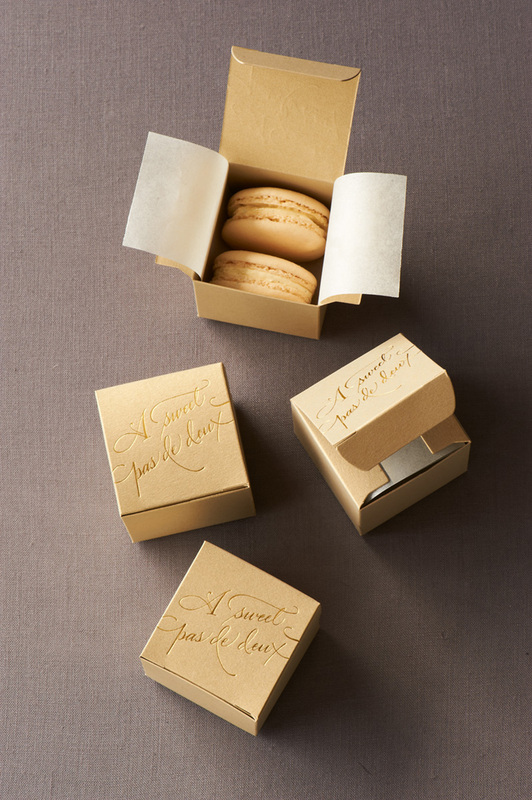 23k loose leaf gold was applied as well. After about 123 hours of work, the last flourish appropriately was put on the word ‘Love’. Then, it occurred to me how much this project was food for the soul. Matthew 4:4 says “Man shall not live on bread alone, but on every word that comes from the mouth of God”. How fitting that my palette was a church dinner plate! My hope is that those who read these Romans 12 words will find encouragement and strength. A big thank you to the dear people of Northminster Presbyterian – it was a delight and a gift to work with you on this project!